AQHA Racing Champion Aged Stallion Moonin The Eagle sold for Quarter Horse racing stallion record of $2.1 million in Friday's second session. OKLAHOMA CITY, OK—NOVEMBER 3, 2018—After a day 1 session with produced a world record price for a racing Quarter Horse stallion at auction, the curtain came down Saturday on this year's Heritage Place Mixed Sale with a strong finish. "The Fall Mixed Sale finished strong as compared to last year," Heritage Place General Manager Spence Kidney said Saturday evening. "The final session saw an 11% increase in the average price of horses sold (in 2017) and we sold an amazing 94% of them, when compared to the final session of last year," he added. It would difficult to beat Friday's session that included the $2.1 million final bid for AQHA Racing Champion Aged Stallion Moonin In The Eagle. "The overall increase in the average is quite large due to the sale of Moonin The Eagle, but when you remove him from the equation and the Jet Black Patriot ($725,000) from last year’s numbers the sale is almost even. It was an exciting weekend for the industry and certainly for everyone who attended the sale. We wish everyone the best of luck and look forward to cataloging the Winter Sale to kick off the year for 2019," Kidney added. The three sessions 2018 average of $15,639 for 426 head sold was up 40% compared to $11,166 in 2017. The 2018 sale gross of $6,662,400 was up 26% compared to $5,303,850 on 475 head sold in 2017. The median had a slight dip from $6,500 in 2017 to $6,300 in 2018. Bobby D. Cox paid $2.1 million, a record auction price for a Quarter Horse race-bred stallion, for Moonin The Eagle a multiple Grade 1 winner of $548,985. Chris Benedict, Agent for AECOM/URS Federal Services consigned the 6-year-old son of leading sire One Famous Eagle. All four high-sellers came from the day 1's catalog see related story). Cox was the sale's leading buyer with the one purchase for $2.1 million. SE Racing Stables, Inc. had one purchase for $200,00 and Rachuan Suarez MVZ had five head totaling $162,700. Chris Benedict, Agent for AECOM/URS Federal Services was the leading consignor with the one lot for $2,100,000. Lazy E Ranch, LLC, Agent sold 32 head for $388,000 and Marty Powers, Agent had 29 head for $212,800. 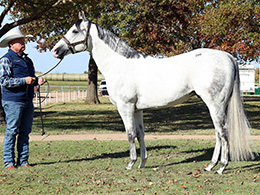 First-crop sale sire Kiss My Hocks was the leading yearling sale sire (by average with two or more sold) with three head averaging $59,667, leading sire Apollitical Jess had five head average $39,800 and leading living sire Corona Cartel had four head for $24,375. 2018's #3 Third-crop sire of money earners Hez Our Secret was the Fall Sale leading covering sire (by average with two or more sold) with two in-foal mares averaging $22,500. Grade 1-placed One Fabulous Eagle had seven in-foal mares average $19,571 and champion Jess Good Candy had two in-foal mares average $18,250. CLICK HERE for preliminary sale results, including hip-by-hip prices.